This Lego clock won Father's Day this year. Photo: Supplied. It's the Father's Day gift that had us applauding - and desperate to make our own. In a post to the Facebook group, Kmart Mums, Brisbane mother Ferne Carmichael shared how she overcame the challenge of getting 17-year-old and 12-year-old boys into "the Father's Day gift thing". The "Lego and Star Wars geeks" made this incredible clock for their dad - and the best part is, it's oh-so-easy to copy. 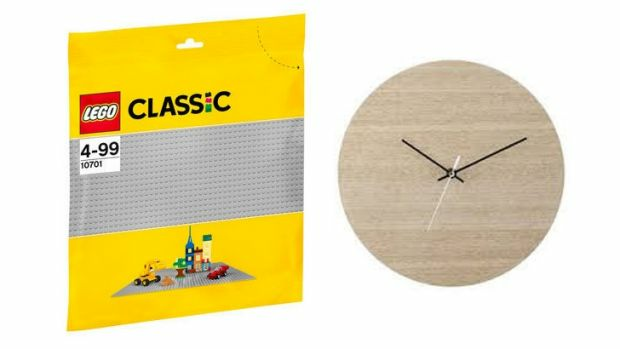 Ms Carmichael explained that she purchased the round wooden clock and Lego base plate from Kmart which they cut "to make it look more attractive than just a square". After using an "exceptionally sharp Stanley knife, plenty of pressure and patience," to cut the base plate, the team then unscrewed the hands, put the base plate on, refitted the hands - and finished the job with the Lego mini figures. Ms Carmichael also ordered online the bracket pieces the figures are standing on. As an added bonus, there was no glue involved. "The look on my eldest son's face when I suggested glueing them in place," Ms Carmichael said. "It's totally interchangeable using just this method." Not including the minifigs her sons had already collected over the years, the project cost $22 in total - $7 for the wooden clock and $15 for the Lego base plate. "The possibilities are endless," she said, adding that it's sure to become a go-to gift for family and friends in the future. "Harry Potter, Ninja and the girls' Lego too." In an update to the post, Ms Carmichael shared that the gift was a resounding success. "Dad loves it!" she wrote. "Plus we had mum and son time making it." The mother-of-two added that the final lineup did need a last-minute readjustment - for functional reasons. "We had to move Yoda and Luke Skywalker around as the minute hand kept getting stuck on Yoda's head," she laughed. With the project completed, there's just one more thing Ms Carmichael says she needs to accomplish. "I guess I'd better learn my Star Wars characters to tell the time now," she said. "It's nearly Darth o'clock. As of yesterday, that's how we tell the time!"